One of the most important trends in personal technology over the past few years has been the evolution of the humble cellphone into a true handheld computer, a device able to replicate many of the key functions of a laptop. But most of these “smart phones” have had lousy software, confusing user interfaces and clumsy music, video and photo playback. And their designers have struggled to balance screen size, keyboard usability and battery life. Now, Apple Inc., whose digital products are hailed for their design and innovation, is jumping into this smart-phone market with the iPhone, which goes on sale in a few days after months of the most frenzied hype and speculation we have ever seen for a single technology product. Even though the phone’s minimum price is a hefty $499, people are already lining up outside Apple stores to be among the first to snag one when they go on sale Friday evening. We have been testing the iPhone for two weeks, in multiple usage scenarios, in cities across the country. Our verdict is that, despite some flaws and feature omissions, the iPhone is, on balance, a beautiful and breakthrough handheld computer. Its software, especially, sets a new bar for the smart-phone industry, and its clever finger-touch interface, which dispenses with a stylus and most buttons, works well, though it sometimes adds steps to common functions. The Apple phone combines intelligent voice calling, and a full-blown iPod, with a beautiful new interface for music and video playback. It offers the best Web browser we have seen on a smart phone, and robust email software. And it synchronizes easily and well with both Windows and Macintosh computers using Apple’s iTunes software. It has the largest and highest-resolution screen of any smart phone we’ve seen, and the most internal memory by far. Yet it is one of the thinnest smart phones available and offers impressive battery life, better than its key competitors claim. The phone is thinner than many smart phones. It feels solid and comfortable in the hand and the way it displays photos, videos and Web pages on its gorgeous screen makes other smart phones look primitive. The iPhone’s most controversial feature, the omission of a physical keyboard in favor of a virtual keyboard on the screen, turned out in our tests to be a nonissue, despite our deep initial skepticism. After five days of use, Walt — who did most of the testing for this review — was able to type on it as quickly and accurately as he could on the Palm Treo he has used for years. This was partly because of smart software that corrects typing errors on the fly. But the iPhone has a major drawback: the cellphone network it uses. It only works with AT&T (formerly Cingular), won’t come in models that use Verizon or Sprint and can’t use the digital cards (called SIM cards) that would allow it to run on T-Mobile’s network. So, the phone can be a poor choice unless you are in areas where AT&T’s coverage is good. It does work overseas, but only via an AT&T roaming plan. In addition, even when you have great AT&T coverage, the iPhone can’t run on AT&T’s fastest cellular data network. Instead, it uses a pokey network called EDGE, which is far slower than the fastest networks from Verizon or Sprint that power many other smart phones. And the initial iPhone model cannot be upgraded to use the faster networks. 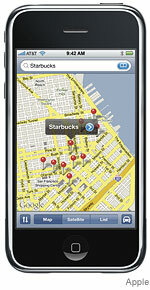 The iPhone compensates by being one of the few smart phones that can also use Wi-Fi wireless networks. When you have access to Wi-Fi, the iPhone flies on the Web. Not only that, but the iPhone automatically switches from EDGE to known Wi-Fi networks when it finds them, and pops up a list of new Wi-Fi networks it encounters as you move. Walt was able to log onto paid Wi-Fi networks at Starbucks and airports, and even used a free Wi-Fi network at Fenway Park in Boston to email pictures taken during a Red Sox game. But this Wi-Fi capability doesn’t fully make up for the lack of a fast cellular data capability, because it is impractical to keep joining and dropping short-range Wi-Fi networks while taking a long walk, or riding in a cab through a city. AT&T is offering special monthly calling plans for the iPhone, all of which include unlimited Internet and email usage. They range from $60 to $220, depending on the number of voice minutes included. In an unusual twist, iPhone buyers won’t choose their plans and activate their phones in the store. Instead, they will do so when they first connect the iPhone to the iTunes software. Despite its simple interface, with just four rows of colorful icons on a black background, the iPhone has too many features and functions to detail completely in this space. But here’s a rundown of the key features, with pros and cons based on our testing. Hardware: The iPhone is simply beautiful. It is thinner than the skinny Samsung BlackJack, yet almost its entire surface is covered by a huge, vivid 3.5-inch display. There’s no physical keyboard, just a single button that takes you to the home screen. The phone is about as long as the Treo 700, the BlackBerry 8800 or the BlackJack, but it’s slightly wider than the BlackJack or Treo, and heavier than the BlackBerry and BlackJack. The display is made of a sturdy glass, not plastic, and while it did pick up smudges, it didn’t acquire a single scratch, even though it was tossed into Walt’s pocket or briefcase, or Katie’s purse, without any protective case or holster. No scratches appeared on the rest of the body either. There are only three buttons along the edges. On the top, there’s one that puts the phone to sleep and wakes it up. And, on the left edge, there’s a volume control and a mute switch. One downside: Some accessories for iPods may not work properly on the iPhone. The headphone jack, which supports both stereo music and phone calls, is deeply recessed, so you may need an adapter for existing headphones. And, while the iPhone uses the standard iPod port on the bottom edge, it doesn’t recognize all car adapters for playing music, only for charging. Apple is considering a software update to fix this. Touch-screen interface: To go through long lists of emails, contacts, or songs, you just “flick” with your finger. To select items, you tap. To enlarge photos, you “pinch” them by placing two fingers on their corners and dragging them in or out. To zoom in on portions of Web pages, you double-tap with your fingers. You cannot use a stylus for any of this. In the Web browser and photo program, if you turn the phone from a vertical to a horizontal position, the image on the screen turns as well and resizes itself to fit. In general, we found this interface, called “multi-touch,” to be effective, practical and fun. But there’s no overall search on the iPhone (except Web searching), and no quick way to move to the top or bottom of pages (except in the Web browser). The only aid is an alphabetical scale on the right in tiny type. There’s also no way to cut, copy, or paste text. And the lack of dedicated hardware buttons for functions like phone, email and contacts means extra taps are needed to start using features. Also, if you are playing music while doing something else, the lack of hardware playback buttons forces you to return to the iPod program to stop the music or change a song. Keyboard: The virtual keys are large and get larger as you touch them. Software tries to guess what you’re typing, and fix errors. Overall, it works. But the error-correction system didn’t seem as clever as the one on the BlackBerry, and you have to switch to a different keyboard view to insert a period or comma, which is annoying. Web browsing: The iPhone is the first smart phone we’ve tested with a real, computer-grade Web browser, a version of Apple’s Safari. It displays entire Web pages, in their real layouts, and allows you to zoom in quickly by either tapping or pinching with your finger. Multiple pages can be open at the same time, and you can conduct Google or Yahoo searches from a built-in search box. Email: The iPhone can connect with most popular consumer email services, including Yahoo, Gmail, AOL, EarthLink and others. It can also handle corporate email using Microsoft’s Exchange system, if your IT department cooperates by enabling a setting on the server. BlackBerry email services can’t be used on an iPhone, but Yahoo Mail supplies free BlackBerry-style “push” email to iPhone users. In our test, this worked fine. Unlike most phone email software, the iPhone’s shows a preview of each message, so you don’t have to open it. And, if there is a photo attached, it shows the photo automatically, without requiring you to click on a link to see it. It can also receive and open Microsoft Word and Excel documents and Adobe PDF files. But it doesn’t allow you to edit or save these files. Memory: The $499 base model comes with four gigabytes of memory, and the $599 model has eight gigabytes. That’s far more than on any other smart phone, but much less than on full-size iPods. Also, there’s no slot for memory-expansion cards. Our test $599 model held 1,325 songs; a dozen videos (including a full-length movie); over 100 photos; and over 100 emails, including some attachments, and still had room left over. Battery life: Like the iPod, but unlike most cellphones, the iPhone lacks a removable battery. So you can’t carry a spare. But its battery life is excellent. In our tests, it got seven hours and 18 minutes of continuous talk time, while the Wi-Fi was on and email was constantly being fetched in the background. That’s close to Apple’s claim of a maximum of eight hours, and far exceeds the talk time claims of other smart phones, which usually top out at five and a half hours. The interface features “cover flow” technology for flipping through album covers. For continuous music playback, again with Wi-Fi on and email being fetched, we got over 22 hours, shy of Apple’s claim of up to 24 hours, but still huge. For video playback, under the same conditions, we got just under Apple’s claim of seven hours, enough to watch four average-length movies. And, for Web browsing and other Internet functions, including sending and receiving emails, viewing Google maps and YouTube videos, we got over nine hours, well above Apple’s claim of up to six hours. In real life, of course, you will do a mix of these things, so the best gauge might be that, in our two-week test, the iPhone generally lasted all day with a typical mix of tasks. Phone calls: The phone interface is clean and simple, but takes more taps to reach than on many other smart phones, because there are no dedicated hardware phone buttons. You also cannot just start typing a name or number, but must scroll through a list of favorites, through your recent call list, or your entire contact list. You can also use a virtual keypad. One great phone feature is called “visual voice mail.” It shows you the names or at least the phone numbers of people who have left you voicemail, so you can quickly listen to those you want. It’s also very easy to turn the speakerphone on and off, or to establish conference calls. Voice call quality was good, but not great. In some places, especially in weak coverage areas, there was some muffling or garbling. But most calls were perfectly audible. The iPhone can use Bluetooth wireless headsets and it comes with wired iPod-style earbuds that include a microphone. Google maps on the iPhone. A downside — there’s no easy way to transfer phone numbers, via AT&T, directly from an existing phone. The iPhone is meant to sync with an address book (and calendar) on a PC. Contacts and calendars: These are pretty straightforward and work well. The calendar lacks a week view, though a list view helps fill that gap. Contacts can be gathered into groups, but the groups can’t be used as email distribution lists. Syncing: The iPhone syncs with both Macs and Windows PCs using iTunes, which handles not only the transfer of music and video, but also photos, contacts, calendar items and browser bookmarks. In our tests, this worked well, even on a Windows Vista machine using the latest version of Outlook as the source for contacts and appointments. iPod: The built-in iPod handles music and video perfectly, and has all the features of a regular iPod. But the interface is entirely new. The famed scroll wheel is gone, and instead finger taps and flicking move you through your collection and virtual controls appear on the screen. There’s also a version of the “cover flow” interface which allows you to select music by flipping through album covers. Other features: There are widgets, or small programs, for accessing weather, stock prices and Google Maps, which includes route directions, but no real-time navigation. Another widget allows you to stream videos from YouTube, and yet another serves as a notepad. There’s a photo program that displays individual pictures or slideshows. The only add-on software Apple is allowing will be Web-based programs that must be accessed through the on-board Web browser. The company says these can be made to look just like built-in programs, but the few we tried weren’t impressive. 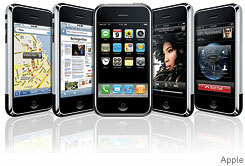 Missing features: The iPhone is missing some features common on some competitors. There’s no instant messaging, only standard text messaging. While its two-megapixel camera took excellent pictures in our tests, it can’t record video. Its otherwise excellent Web browser can’t fully utilize some Web sites, because it doesn’t yet support Adobe’s Flash technology. Although the phone contains a complete iPod, you can’t use your songs as ringtones. There aren’t any games, nor is there any way to directly access Apple’s iTunes Music Store. Apple says it plans to add features to the phone over time, via free downloads, and hints that some of these holes may be filled. Expectations for the iPhone have been so high that it can’t possibly meet them all. It isn’t for the average person who just wants a cheap, small phone for calling and texting. But, despite its network limitations, the iPhone is a whole new experience and a pleasure to use.